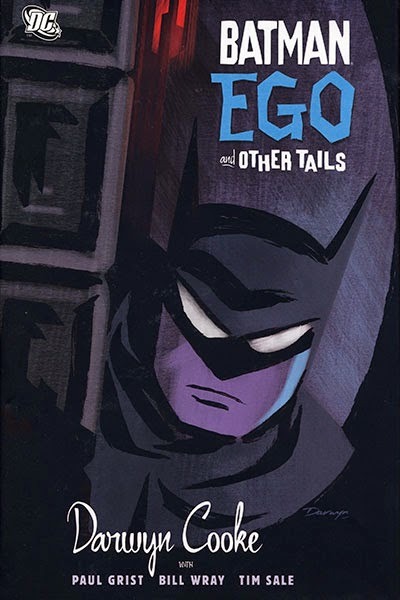 Batman: Ego and Other Tails is nearly all written and illustrated by Canadian comics creator Darwyn Cooke. It’s a collection of shorter works by Cooke, all of which feature Batman except for story that focuses on Catwoman. Paul Grist wrote one of the stories and Bill Wray and Tim Sale drew one story apiece. My enjoyment of the collection was lukewarm as far as the Batman stories are concerned. Nothing really engaging or truly original happens. I enjoyed the art by Cooke, Bill Wray and Tim Sale but the writing that accompanied those stories was flat. I remember very little from the stories and I read them less than a day ago. It’s pleasant to read but it left no impression on me. The Catwoman story, titled “Selina’s Big Score” was a different thing all together. In essence, it’s about Selina Kyle, better known as Catwoman, pulling a heist. At the beginning of the story she does a job that ends without pay and she quickly finds another job to pull, one with a big payout if everything goes right. The rest is played out like a novel written by Richard Stark. People who are familiar with Cooke’s body of work will know that he’s no stranger to Richard Stark, particularly his Parker series. “Selina’s Big Score” follows the formula of the Parker novels and the effect makes for a stellar comic. It’s also a little strange as it also works as a crossover story between Catwoman and Parker. Parker is named Stark and visually he is based on Lee Marvin except he’s uglier which suits the character just fine. The structure is just like that of a Parker novel. It’s in four part and the third part is presented from a different point of view, namely that of Slam Bradley a private detective who resides in Gotham City. The idea to make a crime story starring Selina Kyle is a stroke of genius. Her thieving background makes it a natural fit. It’s not surprising that this 80-odd-pages graphic novel led to an ongoing Catwoman series by Ed Brubaker and Darwyn Cooke. It’s solid work in an otherwise unimpressive collection. Alfred Hitchcock cameo in La Diligence. I’ve mentioned before that my childhood was filled with hours spent reading. I devoured my dad’s collection of bandes dessinées for years. The only reason I stopped is because I eventually moved out of my parents’ house when I finished high school. Since then I’ve occasionally read a BD but nothing has quite captured me like the titles I read in my youth. Last weekend took a few Lucky Luke albums from my dad’s collection and La Diligence is the first of those that I’ve reread. Lucky Luke is still one of my favourite all ages BD. Originally created by Maurice De Bevere, better known by his pen name Morris, Lucky Luke has been in publication since 1946. It’s a giant in the BD industry and new stories continue to be released even after Morris’s death in 2001. 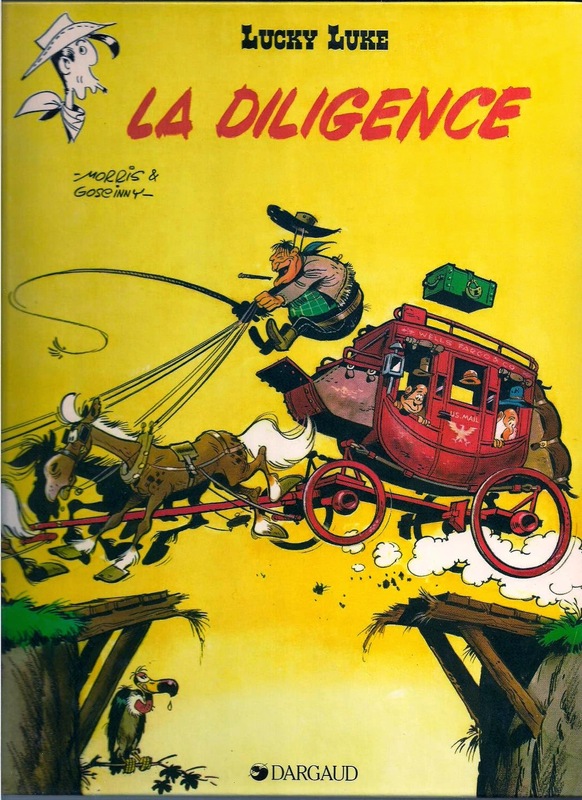 La Diligence is written by René Goscinny, Morris’s most famous collaborator on Lucky Luke. The story is pretty straight forward. Lucky Luke is hired to protect a Wells Fargo & Co. stagecoach as it travels a vast distance to transport gold and passengers from Denver to San Fransisco. The whole thing is a publicity stunt to show the world that Wells Fargo stagecoaches are a safe means of travel. The gold cargo is heavily advertised and as such the stagecoach becomes a target for desperados and thieves throughout the entire journey. 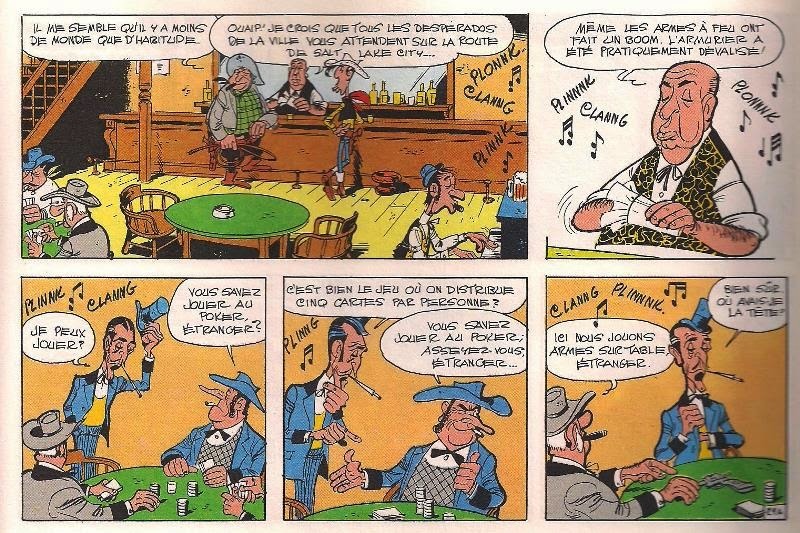 Morris and Goscinny use this simple story to provide the reader with numerous funny scenes in which Lucky Luke gets to show off his skill as a cowboy and the passengers each get their little moment in the spotlight. It’s a fun story that never forgets what it’s all about; that is to say a fun western adventure story with some jokes, some less subtle than others. What makes this is many other Lucky Luke stories is how it takes a few aspects of American history from the 19th Century and spins it into an entertaining BD. This album obviously dealt with the realities of traveling by stagecoach and it’s notably for its inclusion of Black Bart, a notorious thief who specialized in robbing stagecoaches. The historical aspects are often caricaturized but there is still considerable attention given to historical accuracy. At the very least, Lucky Luke: La Diligence tells the kind of story that will not only entertain readers of all ages, it will likely inspire you to do a bit of research on the more historically interesting elements of the story. My review is based on the French edition of La Diligence published by Dargaud published in 1984.